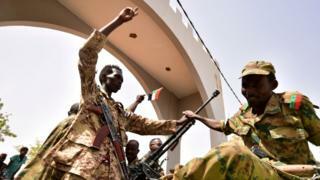 Sudan coup: Are military takeovers on the rise in Africa? Sudan’s President, Omar al-Bashir, has been overthrown in a military coup following widespread street protests against his rule. The army says it will now supervise a two-year transitional period followed by elections. President al-Bashir himself took power following a military coup in 1989 and prior to that there had been many other coup attempts in Sudan, some successful and some not. Reality Check looks back at Sudan’s history of military interventions, and the wider picture across the African continent. Sudan has had more coup attempts than any other country in Africa. Including this most recent intervention, there have been 15 – four of them successful. If the military succeeds in its ambition of permanently ousting Omar al-Bashir, this will be the fifth. Since the 1950s, there’ve been a total of 206 coups attempts in Africa, according to a dataset compiled by two US political scientists, Jonathan Powell and Clayton Thyne. Their definition of a coup is that they are illegal and overt attempts by the military or other civilian officials inside the state to unseat sitting leaders. However, the definition of coup is often contested and in the past, military leaders have denied they were conducting them. Take, for example, Zimbabwe in 2017. The military mounted a takeover to put an end to Robert Mugabe’s 37-year rule. At the time, a top military official, Maj Gen Sibusiso Moyo, went on television to deny flatly that it was a military takeover. “Coup leaders almost invariably deny their action was a coup in an effort to appear legitimate,” says Powell. Zimbabwe: How can you tell if a coup is happening? Powell and Thyne regard a successful coup as one that lasts longer than seven days. Excluding the latest one in Sudan, there have been 105 failed coups in Africa and 100 successful ones. Burkina Faso, in West Africa, has had the most successful ones, with seven. Is Africa having fewer military takeovers? Africa has certainly had a high number of military takeovers, but this particular way of forcing change is, in fact, declining. In the four decades between 1960 and 2000, the number of coup attempts remained remarkably consistent at around 40 per decade. Since then there’s been a significant decline. In the 2000s there were 22 attempts, and in the current decade the number now stands at 17. Jonathan Powell says this is not surprising given the instability African countries experienced in the years after independence. And historically in African countries, the military have generally played a more active role in transitions of power and domestic issues and security. Globally, the total number of coup attempts since 1952 stands at 476. Africa has experienced more coups than any other continent. Next is South America which has had 95 attempted coups, 40 of which were successful. Over the past two decades there has been a decline in the number of South American coup attempts. The last was in Venezuela in 2002, against President Hugo Chavez – which ended in failure. Powell says the end of Cold War dynamics which saw the US and Soviet Union meddle in Latin American affairs, as well as the willingness of the international community to sanction countries which have coups, like Haiti in 1994, has led to the decline of military takeovers.